Acorn squash have an eye-catching acorn shape, deep green color with a splash of yellow when ripe, and beautiful golden flesh. The flesh is slightly sweet and on the dry side. This type of fall and winter squash is often roasted with the thick rind on before eating. Baywater acorn squash shines when tossed with olive oil and herbs and roasted in the oven. Acorn squash puree can be used in soups risotto, or sweet baked goods. Butternut squash is popular on fall and winter menus thanks to its gorgeous orange-yellow flesh, smooth and mild squash flavor, and abundance. The exterior is hard but not as thick as acorn squash and solid orange in color. Our butternut squash can be peeled and sliced and then steamed, baked, roasted, braised, or even grilled. Cooked butternut squash is used in curries, soups, chilis, and Italian dishes like ravioli. The seeds of butternut squash can be roasted like pumpkin seeds for a fun fall treat. Spaghetti squash are sunny yellow in color, large, and ovular. The rind and inner flesh are both hard. As you might have guessed from the name, spaghetti squash is renowned for the way that the inner flesh separates into spaghetti-like strands after roasting. Cooked spaghetti squash is tender, slightly crunchy, and mild in flavor. Spaghetti squash is used as a low-carb and nutritious pasta replacement in pasta dishes, but can also be used in gratins and casseroles. It has an incredibly mild and soft kiss of flavor, so it will take on the flavor of the herbs or ingredients it is cooked with. 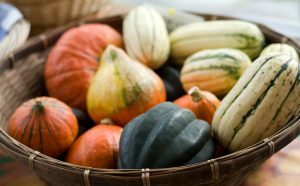 Baywater Farms offers our savory and sweet fall squash varieties in bushel and half bushel boxes. Each variety, including acorn squash, butternut squash, and spaghetti squash is non-GMO, and available throughout the fall and early winter depending on the variety. Acorn squash is ripe when it is dark green in color and when the portions of the squash touching the ground have turned a yellow-orange color. The rind should be hard and firm to the touch. Baywater butternut squash has ripened when the outer color is a deep, matte beige. It should feel heavy and hard, similar to an avocado that hasn’t been ripened yet. Spaghetti squash is ripe when it is a warm yellow color and hard to the touch. The exterior rind should not give or have any soft spots. Picked fall squash should never be refrigerated. Instead, it should be kept in a cool and dark area of your kitchen. In that environment, our fall squash should keep for up to a month. If your squash has been cut, it can be stored in a tightly-sealed container in the refrigerator for up to 5 days. If you have an excess of fall squash, you can cut and freeze potions on cookie sheets and place it into freezer-safe containers. Our family farm grows shoulder season crops to get the most deliciousness out of every growing season that we can. Our shoulder season crops include rainbow carrots, field lettuces, radish mix, fall squash, and sweet potatoes. All of our non-GMO produce is grown using heirloom seeds and sustainable farming methods so that you feel good about what you eat and what you serve. The fruits of our labor aren’t just delicious, they’re locally grown with a conscience. You can find our fresh, beautiful fall squash varieties in national grocery store chains, produce distribution companies, roadside farm stands, local farm-to-table restaurants, CSAs, and farmers’ markets. To learn more about ordering our fresh local produce, click here. Our excellent sustainably grown, non-GMO produce speaks for itself, and we know your taste buds will love to listen!